After I made this quilt top last year I was sort of paralyzed by the idea of finishing it. I debated whether to take the time to do a detailed quilting job, or just to finish it quickly and move on. This week I decided that done is better than debating it for another year! This was a quick quilting job during Jane’s nap time and it definitely won’t be winning any awards, but it’s done! Now it can be donated and go to a child who will love it, instead of hanging unfinished in my closet for another year…or three. I put the plaid print from Hello Jane on the back, and it’s very bright and busy. Luckily my Sophie wanted to keep it for herself, so I know any other little girl will probably love it’s busyness! It’s a weight off my shoulders to finish up all of my quilt tops and put them to good use. THANK YOU for all the great comments and fabric ideas on my last post! I love hearing what draws you to fabric! The Quilty Box winner was MollyP (I emailed you!). This is a beautiful finish! Love this quilt! I finally have your new fabric line in my sewing room and love, love the beautiful colors and prints/solids in it. Looking forward to sewing with it, hopefully soon :)! Love this tutorial and the finish is great. Good job just finishing it. Has to be a big weight off your shoulders. This is so pretty. Nothing wrong with a quick finish. I agree with you. Done is better. I, too, spend way too much time debating the quilting when I should just quilt. I have no intention on entering shows, so I just need to learn to let go and quilt them! Thanks for the inspiration and the tutorial. Yes, Done is Better! I need to get some “done” too. My hubby is not crazy about most of mine! ;) Sew it anyways! Love this quilt! So fresh and bright! well done! I’m stealing that style description “primitive” FMQ…definitely what I used on this quilt LOL! Primitive FMQ! Love it! I’m working on a quilt for my youngest son, and that’s a great description of what I’m doing to it. But – yes- it will be done soon, and he won’t notice the imperfections! Done is definitely better. Thanks for the encouragement! 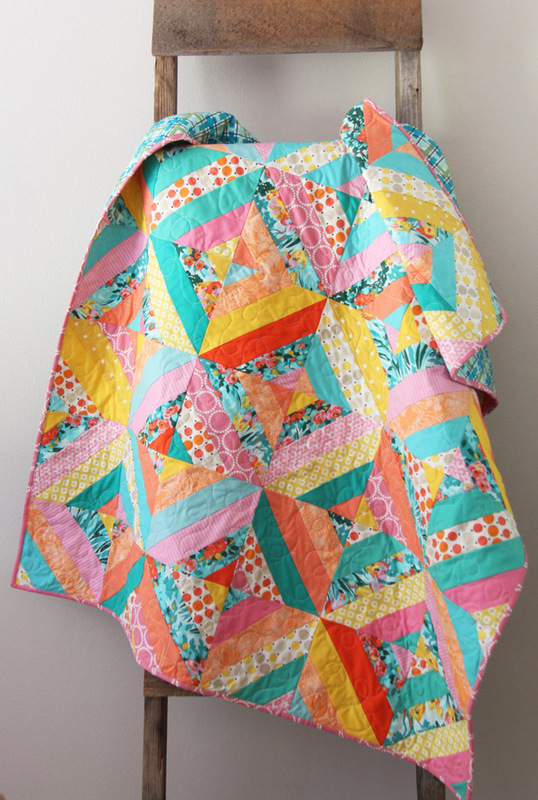 Such a cute quilt and nicely quiltedand finished! So bright and cheery, I love it! Your quilt turned out great and I’ll bet any young girl will love it. 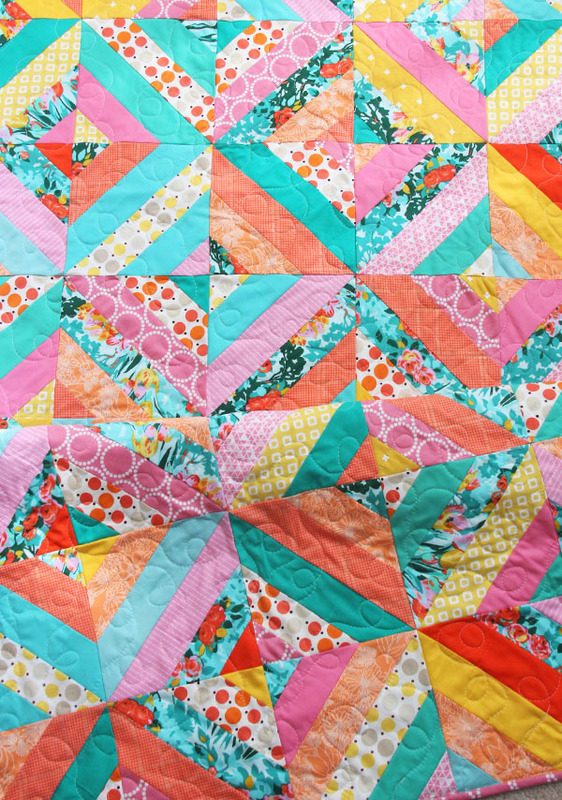 This is such a bright , pretty quilt! Done feels so good, doesn’t it? Thanks for the pattern, I plan to put it to good use! This is such a happy quilt! I love it!! Yes, this is a happy quilt for certain! Done is much better than Siting In The Closet! the quilt is bright & beautiful; thanks for sharing…..any child or adult would love this! Allison, I love all of your quilts, fabric lines, and patterns. 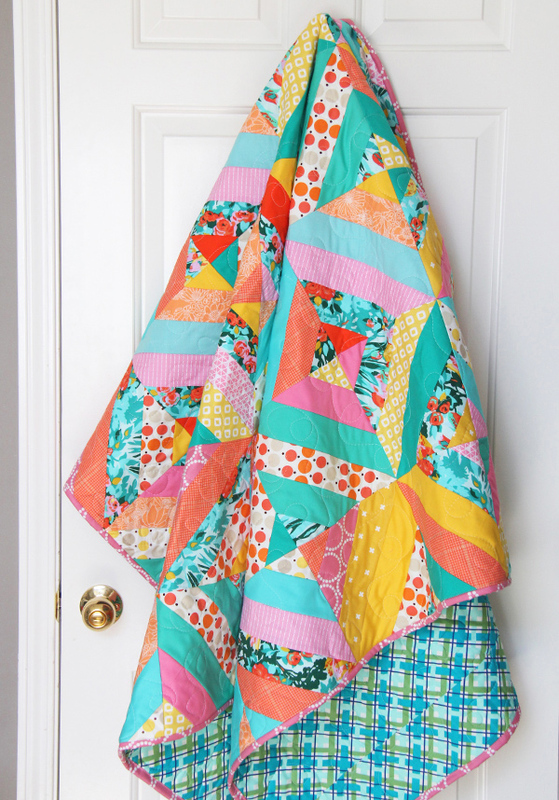 This quilt really demonstrates your talent for mixing colors and prints, and knowing just how many solids to add into the mix. I always look forward to your postings. They inspire me to sew and finish my projects. Thank you Bernadine…what a sweet comment! So Agree! The “how to quilt” paralyzes completion. I just got through that hurdle this week….pieced a quilt full of stars…thought about stippling….meh… and realized that diagonal straight line quilting will eliminate any marking…I’ll just use the star points for reference….Ahhh! Now I want to start another quilt!! Yes, yes, DONE is totally better. 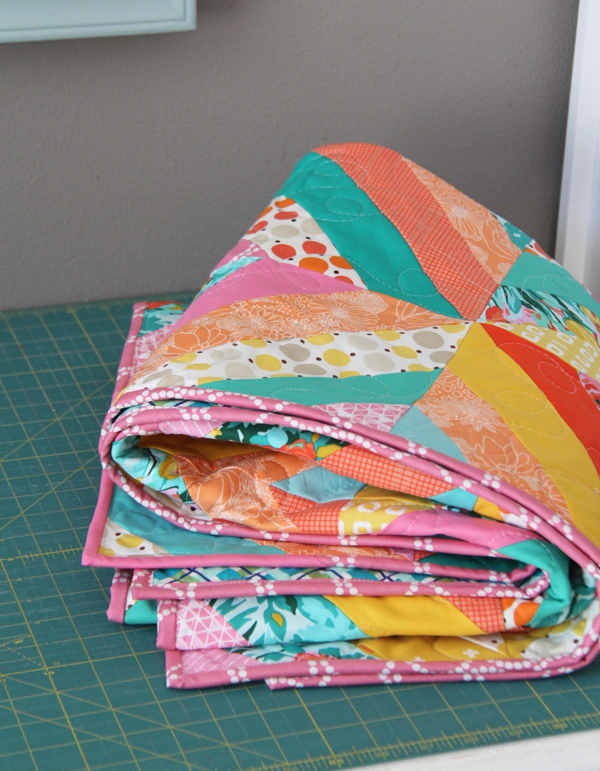 Here’s to easy quilting! I’m a fan. Done is also better than perfect. I have recently finished a 10 year old project. Yes, getting things completed really does make you feel so much better. This is one of my favorite quilts you’ve ever made! It’s so pretty! 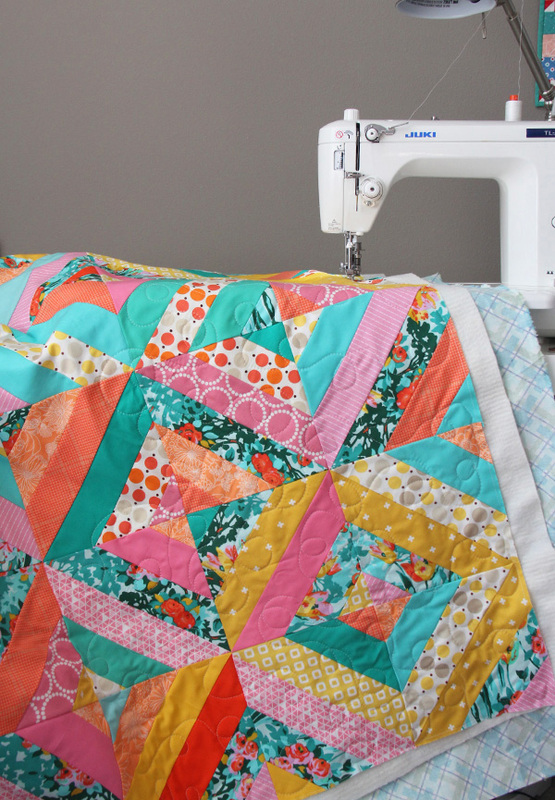 Who wouldn’t love that bright happy quilt? So bright and colorful, love it! Gives me hope for some of the crazy fabrics I’ve bought on sale not knowing what I’d do with them! This is my answer!! Thanks! !